These socks are a small step up from simple 2-by-2 ribbed socks, with the addition of a 6-stitch cable on both sides of the leg (twisting in opposite directions). Gauge: 8.5 sts. / inch in stockinette st. I use one long circular needle to knit socks. You might, too -- or you may use two circs, or four or five double-pointed needles. I'll leave the positioning of stitches on needles up to you. Using long-tail method, c.o. 72 sts. Join to work in the round. These 8 rows (Rows 5-12) form the cable pattern for the leg of the sock. Repeat from ** to ** eight more times. Reposition stitches in order to work heel of choice on the 36 sts. 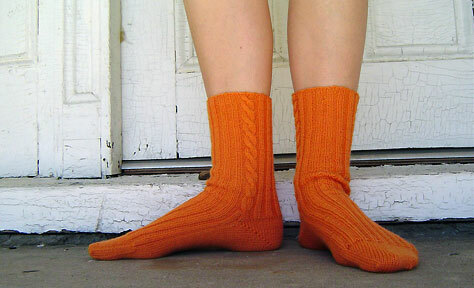 just knit (photo shows short-row heel). 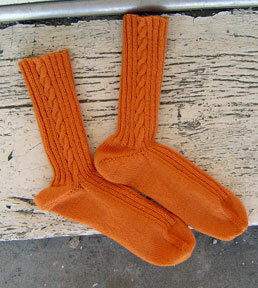 For the foot of the sock, continue ribbing on top 36 sts. as established: p1, *k2, p2* eight times, k2, p1. Knit all sts. on bottom of foot (36 sts. if short-row heel; decrease to 36 sts. if heel flap). Work foot to desired length, leaving about 2 inches for toe. Work toe of choice and graft to close. Weave in loose ends.